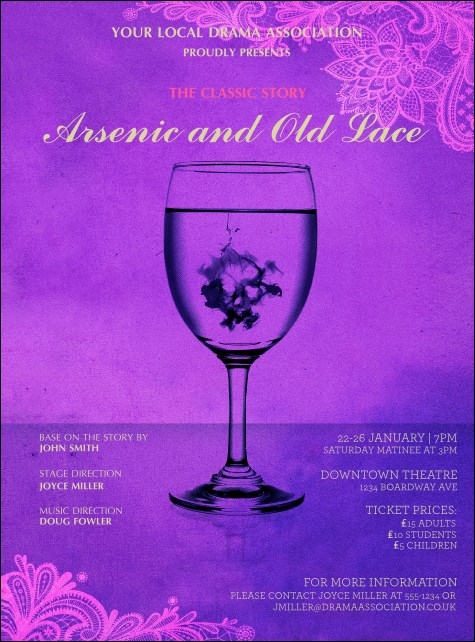 Deal play promotion paralysis a fatal blow when you use the Arsenic & Old Lace Logo Flyer! The theatrical American farce is easily on display with a glass of elderberry wine quickly filling with a deadly potion on a field of amethyst with lace accents. Twenty one text lines and wait for your info. Classic to contemporary, find the right flyer for every occasion at UK Ticket Printing.